To compliment your Royal Baby box or Kensington Box this month. 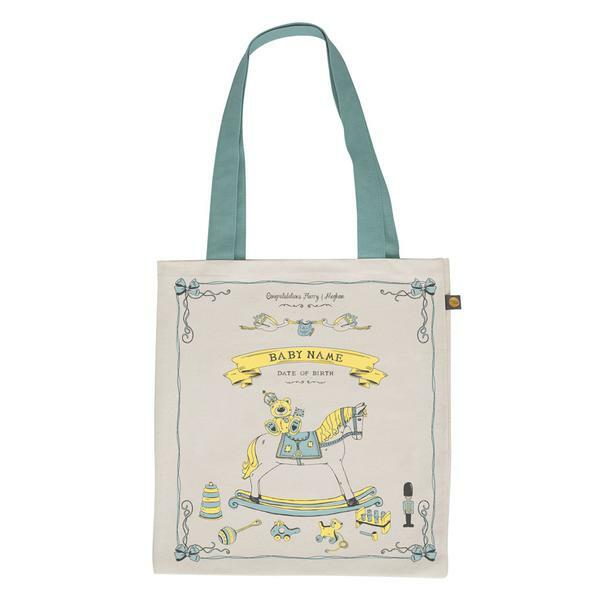 The exclusive offer of the Victoria Egg designed tote bag. Superior quality- Made in Britain. Please note that this is pre-order and will be fulfilled approximately 1-2 weeks after the birth and naming of the Royal Baby. The limited-edition Royal Baby canvas bag celebrates the upcoming birth of the Duke and Duchess of Sussex’s first child. Last year the world paused to watch Prince Harry and Meghan Markle’s fairytale wedding at Windsor Castle and the excitement around the arrival of their new baby is set to be eagerly anticipated. The canvas is proudly handmade in Britain and will come complete with a a decorative commemorative swing ticket. This joyful design makes the perfect Royal baby souvenirs. Handmade in Britain, printed with a different design on each side onto 10oz unbleached canvas. Yellow handles for a girl, teal for a boy.